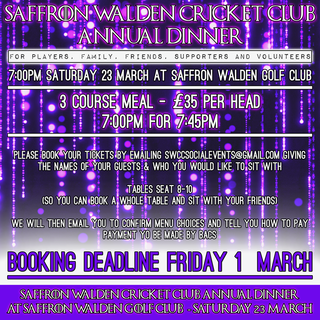 The Annual Club Dinner will be held at the Golf Club on 23rd March. All are welcome! Tickets for this splendid occasion - a chance to catch up with friends before the season over a good meal and some music - are only £35. Book now by emailing swccsocialevents@gmail.com giving the names of your guests and who you would like to sit with (tables seat 8-10, so you can arrange to book a whole table to sit with your friends). Sharon will get back to you about payment and menu choices. This is always a great evening, and we'd love to see you there. Booking deadline: Friday 1 March. SWCC - a Clubmark Club! Congratulations to the 1sts, back in the EAPL!